I LOVE making diaper cakes! I have been making them for a few years now. I watched a few YouTube videos and kind of came up with my own way of making them. I made this cake for a very dear friend last week for her baby shower. It was the perfect centerpiece for the gift table. Would you believe that there are 205 size 3 diapers in this cake?? Phew!!! My friend's smile was priceless when she saw it, which is what I enjoy the most about making these "cakes." You can see more of my cakes here. 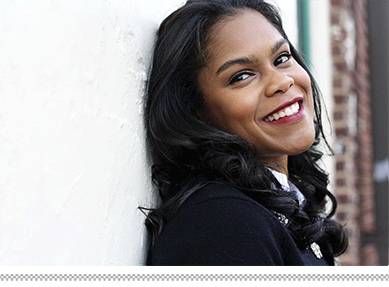 If you live in the Atlanta area and would like for me to make a cake for you, just send me an e-mail to let me know! Love that cake! Awesome attention to detail! Oh my gosh! What a fabulous creation!!! What an entirely wonderful gift and so creative, I've never seen one, but such a great centerpiece to a baby shower too! And I think this is the single most needed gift for new Moms. Thank you for sharing something so generous and creative. 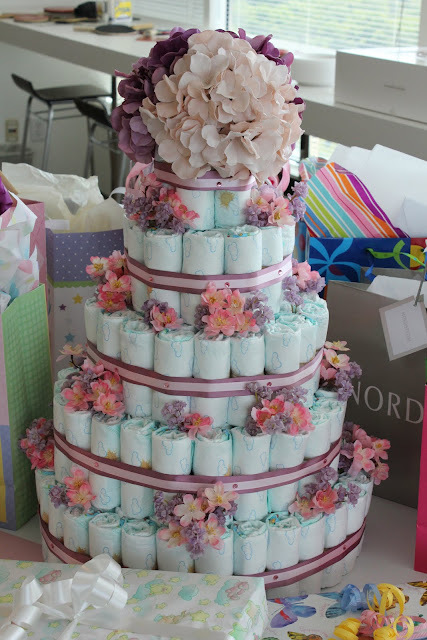 That is one absolutely amazing diaper cake!! You should totally go into business. Just awarded you the "One Lovely Blog Award." So pretty! I love the blooms you used to accessorize it! Thanks for sharing. 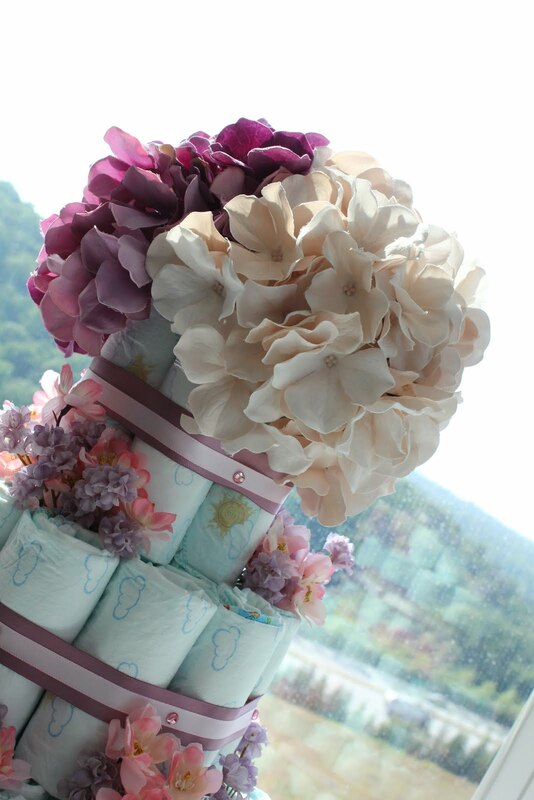 If you hadn't told me it was a diaper cake, I would have never known that was what it was make out of! It is lovely! That was definitely one fantastic centerpiece...crazy creative, girlie! Oh god look at that! Looks better than a lot of wedding cakes I've seen! Wow - you made that?! It's gorgeous!! 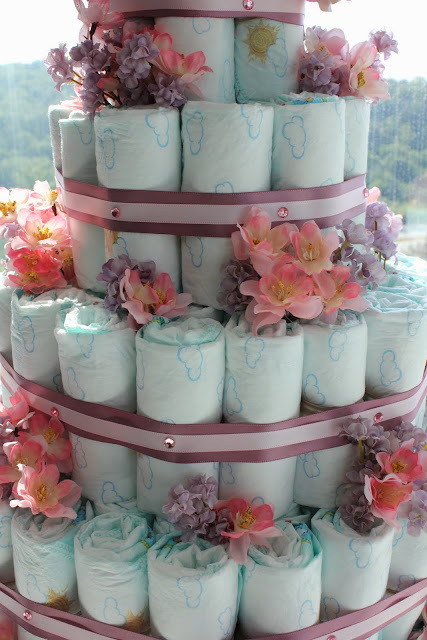 Your diaper cake is beautiful! oh good gawd! me likey. me likey a lot. This cake is awesome! I will be in contact! Hosting a show in Sept!!! 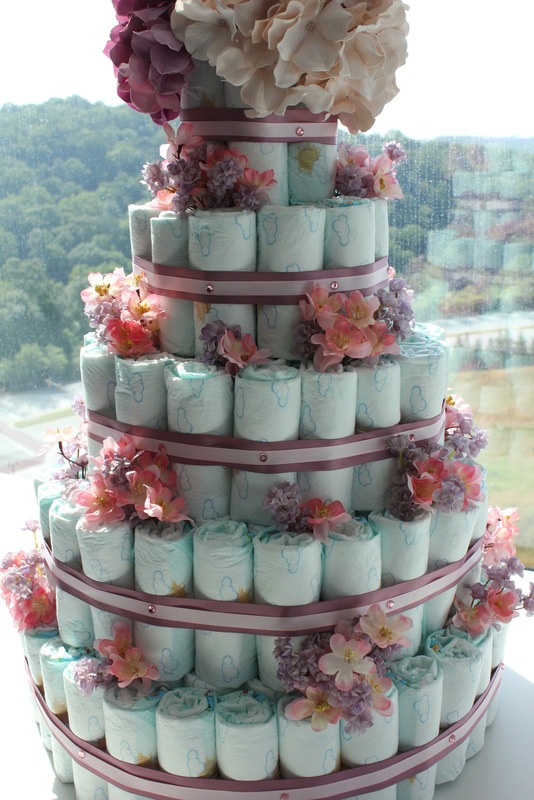 Your diaper cake is beautiful! I love the colors you chose for the ribbon and hydrangeas. It reminds me of the cakes I used to make before I gave it all up to have babies. Have you considered doing wedding cakes? It's a fun business and if you bring half the energy and creative to baking that you do to these diaper cakes than you will be rockin'!